If you go to any live sporting event, you're bound to see dozens of folks glued to their smartphones during every break in the action. Seeing an opportunity to help kill some of that down time, Google created a mobile game that promotes Chromecast, its video streaming device. During Tuesday night's game between the New York Islanders and Pittsburgh Penguins at the Barclays Center in Brooklyn, Google ran calls to action prompting fans to go to a special website on their phones to play a quick game during breaks in the game. 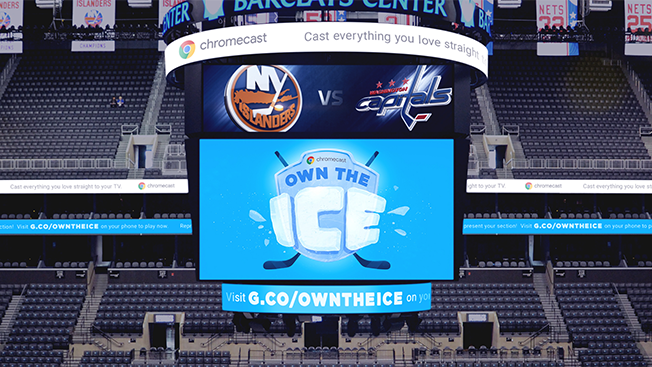 The promos are part of a campaign with PHD and creative shop Rehab Studio called "Own the Ice." "There are a lot of moments at live events where the action stops, and people all the sudden will start talking to each other or they pull out their phone trying to keep themselves entertained for a little bit," said Michael Jenkins, a communications strategist for Google. "This is the first time where we will have up to 18,000 people all experiencing Chromecast—we're creating the biggest living room we've ever created," Jenkins said. First, the site uses the phone's location detection to find out who's in the arena. Then fans are split into four teams that compete against one another. The game challenges fans to tap their smartphone screens as many times as they can in 90 seconds. At the end of the game, each player is given a promo code that can be redeemed for $10 off Chromecast from Google's e-commerce store. PHD's innovation director Christina Gregory said the idea for the campaign came from playing up Chromecast's entertainment features, which stream digital video content to televisions. "We think that advertising for Google should be as fun and innovative as all their products," Gregory said. "Rather than showing off the video or creating an ad, we wanted to create a useful, entertaining experience." Google's campaign runs through the rest of the Islanders' season. After that, Google hopes to run similar campaigns for other live events later this year. "We're hoping to build a case to create more of these experiences out in the world, not even next year but hopefully in Q4 this fall," Jenkins said.